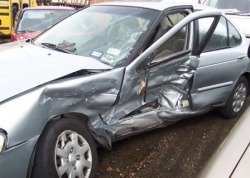 This is the front passenger seat of a minivan that was broadsided in an intersection by a truck. 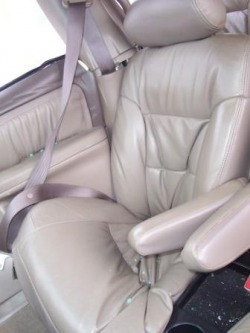 The impact folded the seat over and the passenger was injured. Intersectional collisions are among the most dangerous of wrecks. As a driver, you have to trust that the other drivers obey their red light. However, you can help yourself by staying alert and looking to make sure that all vehicles at the intersecting street have stopped or are stopping. Another danger is turning left at an intersection. Remember that the turning vehicle MUST yield the right of way to oncoming traffic, unless the turning vehicle has a protected left signal (a green arrow). Finally, use caution when turning left onto a street. Look "Left, Right, then Left again". The first place you will be hit is in your door, so look left before entering the lane of traffic.